The Hydrobath is a Vet approved and recommended bathing system. The Hydrobath was founded in Australia in approximately 1991. Since then 100’s of 1000’s of dogs each week across the World are washed and groomed this way. 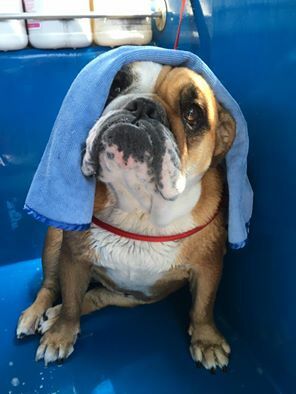 It has proven to be the simplest and best way to have your Pooch washed and at the same time it has the added benefit of using less water than any other bathing system. In fact The Pooch Mobile is currently saving in excess of 1 million Gallons of water per month based on the number of dogs being washed compared to home bathing or similar. The hydrobath sprays pressurized warm fresh water and shampoo through the pooch’s coat. The shower head provides a thorough clean which gets right down into the dog’s coat and gives an invigorating massage, this also helps to alleviate that “Wet Dog Smell” you sometimes get from other forms of bathing. The water from this is then collected, filtered, heated if necessary and then pumped back through the shower head. When the bathing is completed a plug is removed to dump the waste water from the hydrobath. The Hydrobath is rinsed with disinfectant and fresh water is then added to the water collection tank ready to bath the next pooch. The advantages of using a Hydrobath. The hydrobath has the environmentally solutions added to the water which have been designed specifically for this purpose. This mix of water and solutions penetrate directly into your dogs coat and onto the skin where most of the problems occur. Depending on the solutions used they may help cure or prevent skin infections or kill fleas or other parasites. 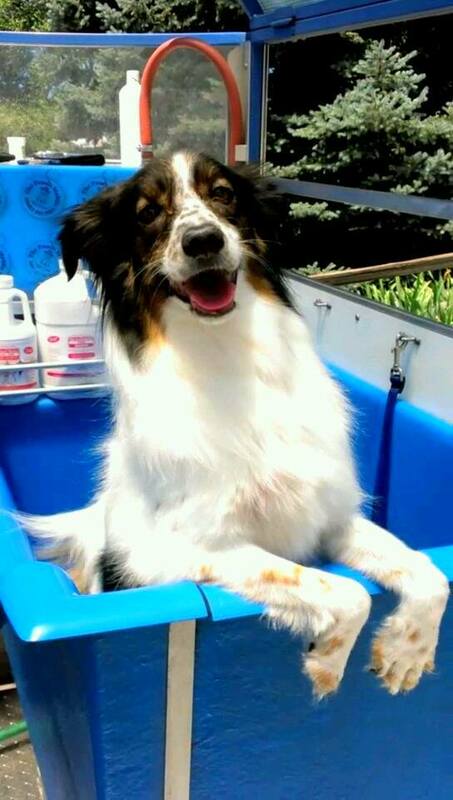 A hydrobath with warm water (Pooch Mobile Hydrobaths all have heating elements which can be used to preset the temperature of the water) can help prevent and alleviate arthritis through the massaging effect of the hydrobath. The hydrobath also open the pores of the dog’s skin releasing the dead hair more than any other form of washing will do, this helps in the reduction of the dreaded shedding and we all know we all need help with this. With The Pooch Mobile Operators calling at your home you will have no more soggy towels and you and your bathroom will be left clean and dry. Hydrobaths when used correctly achieve great results in preventing and helping to cure skin disorders and promoting hair growth. The proof is in our customers comments. Why have your dog washed by The Pooch Mobile dog wash? The advantages gained from any bathing system can be attributed not only to the system that is used but also to any person performing such a service. the care of your pooch, the operation of the hydrobaths and the exclusive range of solutions that are used. A Pooch Mobile Operator does not just bath your dog, they really do care about your dog’s well-being!